Bank Building Corporation engages in the acquisition and development of properties for lease as bank branches. Carter Bank, based in Martinsville, VA, is one of the largest independent state chartered commercial banks headquartered in Virginia, operating 124 branches in Virginia and North Carolina. Carter Bank & Trust (OTC: CARE) and Bank Building Corporation merged and Carter Bank is the surviving corporation following the merger. 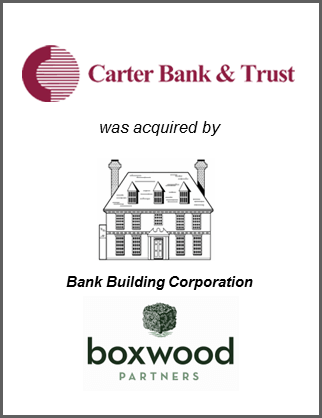 Boxwood Partners, LLC acted as the exclusive financial advisor to Carter Bank & Trust with respect to the transaction.